More and more the modern architecture looks at the design of energy-independent buildings with "green architecture".Modern projects are beginning to integrate not only sustainable materials but whole landscapes and earth systems.At the same time, the most important purpose of the green building is to minimise water use, optimise energy efficiency, generate less waste, preserve natural resources, and thus, provide residents with a healthy living and working environment. Ranking of the most green or the most sustainable building in the world is almost impossible to do, so we chose to present some of our favourites.These projects - which are being implemented or are in the process of being realised - demonstrate a different approach of architects and construction companies at the implementation of façade engineering,bold design, innovative materials and technologies. The Hyperion Towers are expected to become a reality in 2020 and change the look of New Delhi. Parisian architect Vincent Calebaut, inspired by the tall trees of Hyperion in northern California, has designed a functional and sustainable building that will produce more energy than its residents can afford to spend. 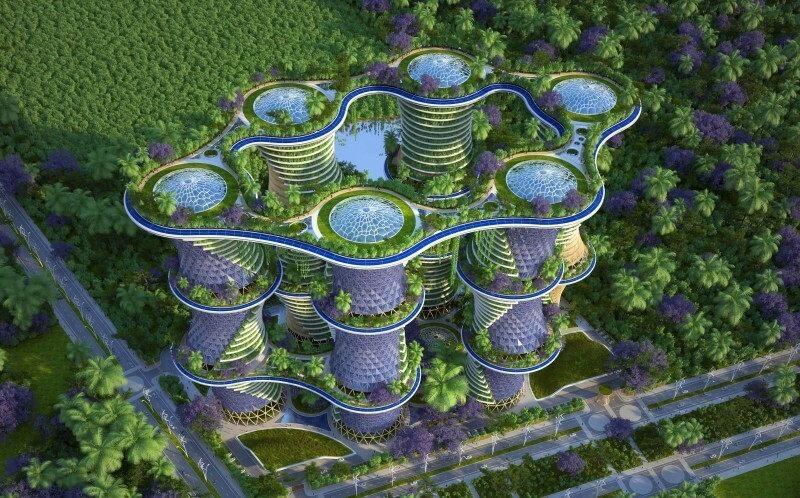 The most interesting thing is that towers will integrate urban farms with a special sowing area and domestic animals for milk and meat production. Agricultural products will then be used for alternative forms of energy. The implementation of this project is not over yet, but Apple's Director-General Tim Cook already calls it the greenest building on the planet.Apple's desire is to power the entire campus with 100% renewable energy and the company promises to plant at least 7,000 new trees. This amazing building is located in Bechteland is designed for environmental education.This is indeed a house among trees that rise in the bosom of this nature reserve.Visitors can learn about the different levels of an ecosystem as they pass through the wooden house.They can even see how "the building works inside", learn about the water purification system, alternative energy sources and other innovative technologies. Singapore Technical University is a fantastic example of ecological architecture that is both sustainable and impressive. This building has five floors with plenty of glass panels.The effect of this is achieving high energy efficiency, as the building is designed in a swirling semi-circle that minimises heat loss. At the same time, the roofs of this building are entirely green and covered by lawns, combining urban and rural landscapes.On the one hand, these areas provide perfect isolation and on the other, they serve as spaces for students' gathering.